With its emphasis on ritual and aesthetics, the ceremonial presentation of tea provides a fascinating introduction to many aspects of Japanese culture. In the popular classic The Book of Tea, Japanese scholar Okakura Kakuzo seeks to explain "the way of tea" to westerners, in the hope that they will understand this insightful ritual as far more than the offering of a mere brewed beverage. His profound, poetic work explores the history of tea as well as the subtler Zen spirituality behind the centuries-old ceremony. 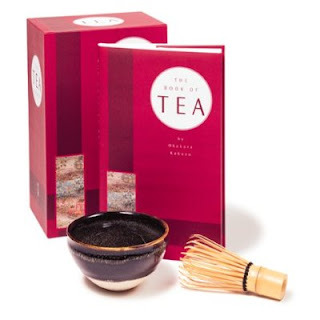 This beautifully designed kit contains Kakuzo's Book of Tea plus utensils to use in recreating the tea ceremony at home: a traditional bowl and split bamboo whisk. It's a wonderful way to get in touch with life's pure and simple pleasures and to learn to savor a bowl of tea in the most eloquent way. Sen-no-Rikyu is the most famous master of sado, and anyone interested in cha-no-yu or late 16th Century Japanese history will enjoy this film. However, be prepared to be hit with many historical one-liners meant to prompt your Japanese historical memory that the viewer is expected to know; maybe this is not a problem with Japanese viewers, but people without a background in the Nobunaga-Hideyoshi-Ieyasu unification of Japan period should have a good Japanese history at their side to understand the historical currents behind the dialog. These would include the conflicts among the above 3, the persecution of religions, the conquering of rival daimyo, and the invasion of Korea. Yamazaki, I thought, did a superb portrayal of Hideyoshi (Nakamura Hiyoshi) of village origins who rose to be "Kwampaku" (imperial representative) of all Japan. Written by contemporary tea masters, The Tea Ceremony takes a clear and comprehensive look at the sources and inspiration of this ancient discipline. The authors trace the practice from its earliest origins to the present day, considering in detail the individuals who helped it evolve. They discuss all the elements of the ceremony-including art, architecture, incense, flowers, and the influence of Zen-and show how readily the study of tea can serve as a spiritual path to greater insight and calm. Originally published in 1973, The Tea Ceremony has been revised extensively. Along with a rewritten and updated text, entirely new photographs and line drawings have been selected. Over 75 step-by-step stills of the tea ritual itself, featuring a number of close-up shots, give the reader a fuller visual understanding of the ceremony. Numerous line drawings illuminating the more important elements of the ceremony have been inserted for the first time, and for those readers wishing to delve further into the subject, bilingual charts of tea terms have been appended.